Join the ContentGenerator.net community forums and download immediately. You have to answer 15 questions correctly to try and fling your teacher away. Whole application has been carefully designed for ease of use. The generator interface allows you to save and load your data files. You can thus easily differentiate, adapt and improve your games. New - SCORM compliant, meaning scores can be tracked with your VLE. The game can be used an a wide variety of situations - is fantastic with a entire class via an interactive whiteboard and projector. Easily link your games into existing online materials - ideal for intranets, websites and VLEs. Based around multiple-choice questions together with 'helplines' - 'Take two away', 'Take a vote' and 'Ask an expert'. 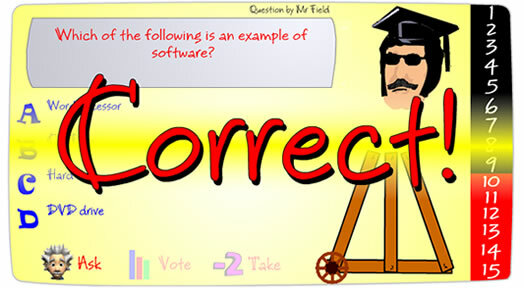 Each correct answer helps construct the trebuchet to fling the teacher away. Your own game in minutes - type your questions in, press generate - that's it! See the ContentGenerator.net community forums for further feedback. Windows 98, ME, 2000, XP or Vista. Also works with Intel Macs via Parallels / VM Ware. Any device with the free Adobe Flash Player installed. The games you generate can be uploaded to a website, used on a school network or just directly from an individual PC. The Flash game can be used on any computer or device with the Flash player installed. This section will contain information about the development of the program - currently the following information still needs to be updated fully.